Not everyone has the urge to go on a months-long trips to different countries, but one local traveler did just that earlier this year. Duvall’s Lynnea Zuniga recently returned from a five-month journey into and across Mongolia. She made it through several landscapes and provinces in the country, all between May and September. A trip like that was made possible through experience. This wasn’t her first long-term, long-distance travel. Zuniga said she grew up adventuring in the back woods of Duvall, dirt biking and horse riding. Being so close to the outdoors and away from some of the larger urban areas informed her personal interests when she went to Northwest University where she studied environmental science, international development and sustainable agriculture. When she was 17, Zuniga went on her first trip to the island of New Guinea, where she lived with two native tribes. A few years later she completed a solo bike tour from Hungary to Germany and Switzerland. Her experience travelling inspired her to keep finding new places. Traveling to Mongolia, however, was recommended to her by a friend. “One of my good friends said in passing ‘wouldn’t it be amazing to ride a horse across Mongolia?’ and from that instant I knew that I was going to do it some day,” she said. Bots are pesky creatures, capable of causing irritation and physical damage to horses. They aren't categorized as being the worst of internal parasites, but they can cause problems externally and internally. The external aspect is primarily one of irritation to the horse. The botfly is about the size of a honeybee, and its prime purpose in life is to lay eggs on the hairs of equine legs, necks, faces, and other parts of the anatomy. And although we will talk later about "deworming" as a weapon against these parasites, they are not really worms, such as ascarids and strongyles. Instead they are flies, and like other flies their life cycle involves four distinct stages—egg, larva, pupa, and adult fly. As is the case with other parasites, bots need a host to carry out their life cycle. They are specialists, in that they only attack horses, mules, and donkeys—perhaps zebras as well—and do not seek to use cattle or other livestock as hosts. Words: Grant Hollins. Images: Julie-Anne Gower. Wild Coast Horseback Adventures has been offering horse riding trails along the Eastern Cape’s spectacular eastern coast for more than a decade and is listed as one of the top beach riding destinations in the world. Grant Hollins went to Kei Mouth to meet with owner Julie-Anne Gower to find out more. Endurance riders have a great many Endurance Riding events to choose from, each with its own particular set of challenges. Many riders learn the ropes via their local Endurance GB, ILDRA or SERC group or similar clubs overseas. With respect, but novices don’t always get advice from the most accomplished riders. This page aims to help you to several fantastic tips for Endurance Riding which make Endurance Riding more enjoyable and successful for you and your horse. These videos feature Sally Toye and her horse Emira Bint Letifa. Kindly note that the number of videos in this page will grow, we have lots more tips for you! Like our facebook page so you won’t miss out on the next video tip. Aloeride is very proud to sponsor Sally Toye who is a very experienced and successful Endurance rider both in the UK, Ireland and the US. She also qualified for the 2017 Mongol Derby. As published in The Northwest Horse Source, November 2017 edition. My summer of trail rides and horse camping was wonderful. Until it wasn’t. You might have heard that I took a tumble recently. It’s true. 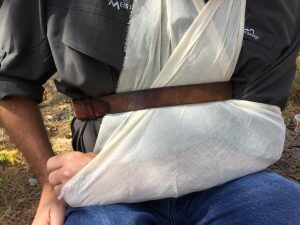 I was riding in the Three Sisters Wilderness in central Oregon when I joined the unplanned dismount club. Although I don’t remember all of it, I got to visit the hospital ER, met some great doctors, toured the surgery, and now I have a shiny new shoulder! Fun times. What is the best use of fats to help horses maintain weight during the cooler winter months? • Oils, which include everything from common vegetable oils such as canola oil to less well-known vegetable oils such as camelina. Fish oil is even an option. Back Country Horsemen of America formed over 40 years ago to protect our right to ride horses on public lands. The original founders cherished the wide swaths of wild land that encompass hundreds of thousands of acres with trails inaccessible to nearly anything but those on foot or hoof. Today, we still treasure those vast areas, but we also highly value the smaller public lands nestled between cities and highways, the few hundreds or thousands of acres that give us a respite from our busy daily life. These front country gems may not sit on mountaintops where the worst of weather pulls down trees and washes out trail treads, but they still need consistent maintenance due to the heavy use we give them. In fact, this is a strong argument for creating more local public lands. Easy accessibility to the few that we have attracts recreationists of every kind, including hikers, dog walkers, bicyclists, equestrians, and more, in numbers higher than most lands can sustain. Instead of limiting use at individual public lands, creating more recreation opportunities would spread our use across more lands. Back Country Horsemen chapters across the nation carefully plan their resources to attend to the places with the highest needs and the heaviest use first. At least once yearly, the Olympic Chapter of Back Country Horsemen of Washington reviews its work budget to determine where its effort is most badly needed. Members realized that they tend to return to Green Mountain Horse Camp in Green Mountain State Forest several times each year to repeatedly perform the same repairs. To reduce this inefficient use of their limited time, the chapter decided to overhaul the horse corrals, the biggest maintenance need in the camp. The land surrounding the popular corrals collected rainwater, making the corral area muddy and difficult for campers to clean, and the wood rails had rotted from exposure to the elements. To overhaul the corrals, the Olympic Chapter drew on the skill within their membership: landscape designer Brian Sundberg created the plan, former Chapter President Jim Davis served as liaison and procured materials, past BCHA Chair Jim Murphy wrote up the specifications, and other chapter members provided tools, equipment (including a Bobcat), hard work, and rations. Chapter volunteers began by removing all the soft and rotten posts and rails. To reduce the level of maintenance required after renovation, they hardened the corral footing, which would allow water to drain away while providing a firm surface that would be easier to keep clean. After excavating the 100-foot-by-30-foot footprint of the corral area about 8 inches deep, they installed a drainpipe system to carry water away from the camp, then filled in the area with crushed rock. They then installed corral posts and rails, using pressure treated and metal materials for durability. Anyone who has done landscaping or similar construction knows that these materials aren’t cheap, making a project like this pricey, even when the labor is free. Including over $6000 for footing materials, nearly $2000 for weather-durable gates and posts, and over $500 for heavy equipment fuel along with other miscellaneous costs, the final price tag came to almost $10,000 for the sixteen 12-foot-by-12-foot corrals. The state Department of Natural Resources (DNR) donated the pressure treated posts and rails, but the rest of the cost was carried by the Olympic Chapter Back Country Horsemen. How did they do it? They organize the Western Dream Ride at a dude ranch in the stunning Cascade Mountains. Horse lovers spend three days living in rustic ranch cabins, eating authentic back country meals, and riding amazing trails. The Olympic Back Country Horsemen also provide western style entertainment, Cowboy Church, a silent auction, and even a swimming pool. Offering this well-loved event to up to 130 riders every year takes the full commitment of the entire chapter, but participants and volunteers know that it makes funds available to perform maintenance and improvements to trails, trailheads, and camps in Green Mountain State Forest. Although northwest Washington boasts many horse trails that traverse its awe-inspiring mountains, riders still enjoy front country trails for day rides and when mountain trails are closed. Managed by the state DNR, Green Mountain State Forest is an undeveloped working land that provides habitat for native plants and animals, water retention, and water quality benefits. Its 6,000 acres provide diverse recreation opportunities to more than 150,000 people each year. The Olympic Chapter has a volunteer contract with the DNR to maintain the trails and the horse camp. As part of the contract, the chapter also provides a friendly Camp Host at the horse camp on weekends from Memorial Day weekend through Labor Day. When recreational trail riders started using the horse corrals renovated by the Olympic Chapter Back Country Horsemen, compliments and rave reviews began coming in. People love the new corrals as well as the minor repairs and grooming the chapter completed on the 17 camp sites. 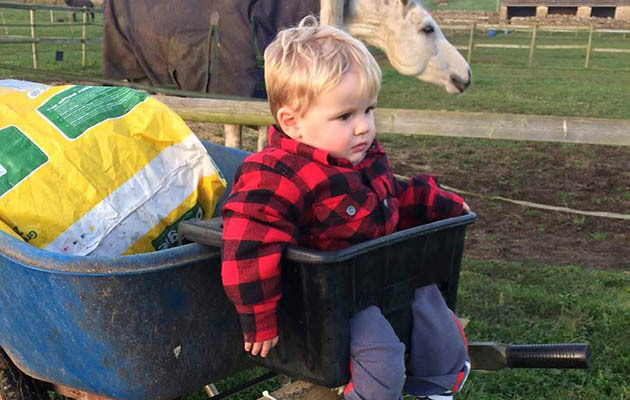 An endurance rider and her husband have developed an innovative way of keeping toddlers safe and involved at the yard. Gloucestershire-based Adam Farley thought up the idea last October when he was looking after his then 18-month-old son Ollie while his wife Rachael Claridge was in Australia. Adam was kept busy looking after the family’s four horses and two dogs, as well as working full-time. “He was thinking of a way to keep our toddler safe,” Rachael told H&H. “He bought a bucket, cut a couple of holes in it, fixed it to the wheelbarrow and stuck Ollie in it. WHAT TO SAY TO CYCLISTS? So, when I saw this posted on our Equestrian board today, I thought some of you out there might find this handy if you get the chance to offer a cyclist’s explanation to other cyclists about equine safely. It’s important to keep your horse fit, but overdoing it can cause problems. The military and horses have a long shared history, starting with their partnership on the battlefield. Today, there’s still a deep connection through a number of charities. In advance of Veterans Day on Nov. 11, we highlight two that bring horses and veterans together and one that honors equines’ military service while supporting today’s working horses, donkeys, and mules. Check the supplement stash at any performance stable, and you are likely to find a bottle of aloe vera juice, which some horse owners reach for to prevent or treat ulcers. But is it effective? To shed some light on this practice, a team of researchers at the University of Adelaide, in Australia, conducted a randomized, blinded clinical trial comparing the efficacy of aloe vera inner leaf gel to omeprazole for treating equine gastric ulcer syndrome, the first study of its kind. The team studied 40 horses with Grade 2 or higher ulcer lesions (confirmed via gastroscopy) in the upper portion (squamous) and/or lower portion (glandular) of the stomach, randomly assigning them to one of two groups. One group received 17.6 mg/kg body weight of aloe vera inner leaf gel twice daily (a dose they settled on using data from similar studies performed in rats), while the other group received 4 mg/kg body weight omeprazole once daily. After four weeks of treatment, the team performed a repeat gastroscopy. Horses with persistent ulceration received a course of omeprazole and were re-examined after four weeks. When it comes to breeding good endurance horses, many traits aren’t heritable or have little to do with performance. But French researchers said one feature does matter: the heart. “An ‘athletic’ heart is a heritable characteristic that’s favorable for performance in endurance,” said Céline Robert, PhD, DVM, professor and researcher at the National Veterinary School of Maisons-Alfort and researcher at the French National Agricultural Research Institute in Jouy-en-Josas, France. Unlike Thoroughbred racehorses, Arabian and Arabian-cross endurance horses start training at around age 4 or 5 and reach high-level (160-kilometer) races starting at about 8 years old. “If you have to invest eight years of training and maintenance into a horse before you know if you’ve got a champion, you want to be sure you’re starting off with the right horse,” Robert said. But success doesn’t always pass down through the genes. That’s why Roberts and her fellow researchers set out to determine what genetic factors affect performance and how heritable they are. They found that most measurable traits—whether related to morphology, gaits, or cardiology—have little to do with success on endurance rides. And that’s consistent with her 2014 findings, which were limited to morphology alone. “Few traits are related to performance, and few of those have strong heritability,” she said.